Gone with the error. Next up. Colorised output with contextual information. Something I previewed here. Ok. This is actually a screenshot made with v2.2 and thus the output is slightly different. Thing is. Most people will find this improvement handy. Hey. Even I do. Error: AAPL,ig-platform-id: 0 NOT found! Please choose a target platformID (0/1-22) ? Please choose a target platformID (0/1-12) ? All you need to do is to rename AppleIntelFramebufferAzul.sh to AppleIntelFramebufferCapri.sh but the patch and unto options can only work after you’ve replaced the data in function _initPatchedPlatformInfo and _initFactoryPlatformInfo. Duh! Edit: Here is a first glimpse of something that I want to introduce in a next update; colorised output with contextual information about the data. And that is just one of the many improvements that I have in mind for you. I have updated AppleIntelCPUPowerManagementInfo.kext and renamed it to AppleIntelInfo.kext. It is now also much easier to get from my Github repository, and without having to pull/clone RevoBoot. AppleIntelInfo.kext is currently at version 1.0 and includes a new feature which I named: Intel GPU Register Dumper for OS X. This new feature is controlled by another setting in Info.plist (logIntelRegs) and it is set to True by default. The latter may be a problem for people without the IGPU being active/visible but that is something we have to figure out together. Have a look at Yosemite DP6 with HD4600 to see what it dumps, and it dumps even more now. Anyway. Now we don’t need to boot into Linux anymore, just to obtain the Intel GPU register data (think: intel_reg_dumper). AppleIntelInfo.kext is brand new and may crash!!! In fact I would be surprised if it doesn’t so be prepared. I have very little time to explain what I did, but here is one of the framebuffers that works for me – edit the frame buffers for your setup, follow the links under ‘See also’ for additional information. Note: 0x0d220003 is just an example – my first Haswell boot was done with 0x0c260000 (see also: Intel HD4600 with full resolution) but I changed it to 0x0a160000 the same day (see _DSM method) but now I let RevoBoot inject 0x04120000. Tip: VRAM (Video RAM) is not the (UEFI) BIOS settings. That is ‘fStolenMemorySize’. Representing the amount of pre-allocated DRAM memory to support the IGPU in VGA (non-linear) and Native (linear) modes. Not that you need it, because VGA is disabled. 1.) No boot loader changes! 3.) No frame buffer crashes. 4.) Boot with single DVI/HDMI/DP connector possible. 5.) Connects to pipe 0. 6.) APPL,boot-display property (Boolean) set to True. 7.) IOFBNeedsRefresh property (Boolean) set to False. 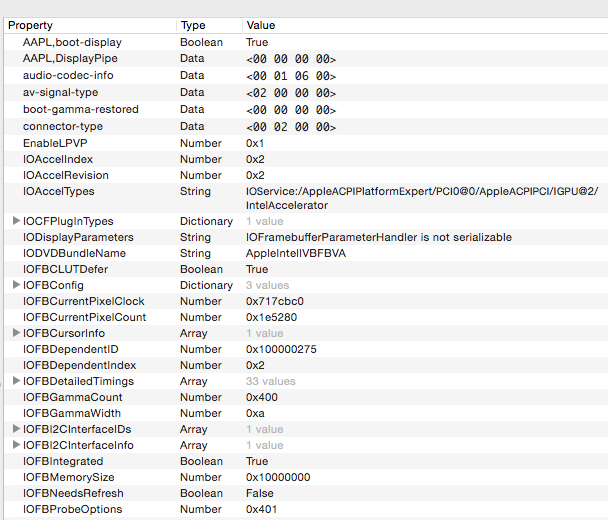 I want to rename AppleIntelCPUPowerManagementInfo.kext to AppleIntelinfo.kext and give it its own Github repository. That way I can update the source code more easily and add the new Intel Register Dumper tool code. A must have for IGPU only users. The problem is that I do not have the time for it… so is anyone reading this willing to do this for me? Don’t bother. Already done! Please note that the new kext must run on a Yosemite system so you need the Xcode Beta! I have updated AIFBAzul.sh and renamed it to AppleIntelFramebufferAzul.sh. It is now also much easier to get, from my Github repository instead of my Dropbox. before anything can be patched, of course. In version 1.6 I added some lines to ask to reboot, which I found handy, and in version 1.7 I also added new code to make the dump option work without Xcode’s nm.